Elizabeth Weir was born in Hammond, TX in the year 2342. Elizabeth was miserable growing in Texas and couldn't wait to not only leave TX but Earth as well. Elizabeth excelled at school growing up in Texas. So at the age of eighteen she enlisted in Starfleet. She could have entered the Academy but she did not want to spend four more years on Earth in school. 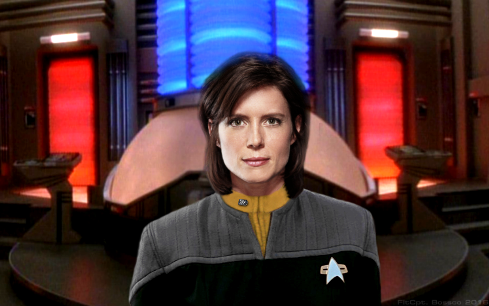 After completing boot camp she was assigned to the USS Ghandi as a warp core specialist. After spending a little over ten years on the Ghandi she was transferred to the Miranda. In 2379, she was transferred again this time to the newly commissioned USS Odyssey. Even though the vessel had a quantum slipstream drive it still had a traditional warp drive for her to work with.